Men and women have adorned themselves with handmade jewelry since long before the age of reason. Garlands of flowers, bracelets of woven grass, shells, and stone; such were the first decorations to beautify the human body. We may have been wearing jewelry as far back as 75,000 years ago -- 30,000 years earlier than previously believed -- according to a recent report by National Geographic News. With this renewed demand, jewelry artisans the world over are enjoying improved sales and recognition for their talents and skills. Many specialty galleries -- and even major department stores -- now feature an increasing array of handmade jewelry. With the advent and spread of the Internet as a sales tool worldwide, many international jewelry artisans, even located in remote regions, are also enjoying the benefits of direct sales to distant customers. Novica hosts the largest handmade jewelry marketplace on the Internet, featuring some 15,000 unique designs, direct from master artisans in Africa, Asia, and Latin America. Regina Bimadona, director of Novica's regional office in Bali, herself a jewelry artist, works closely with master jewelers in Bali and Java, helping them bring their collections, and the unique stories behind those collections, to appreciative customers worldwide. Bimadona specializes in assisting jewelers who still create limited-edition collections with traditional, handmade techniques. 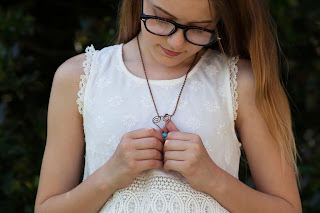 RB: Handmade jewelry is crafted by hands, instead of mechanically made with machines. Handmade jewelers use old metal-smith skills, simple tools, and a broad variety of techniques to create their desired forms and shapes. In handmade jewelry you can often observe each item's uniqueness, its dissimilarity from similar pieces. You can also usually sense the cultural individuality, meaning, and even history behind many such designs, even if such information is not provided along with the jewelry. Handmade jewelry techniques require considerable concentration, time, skill, creativity, and dedication. This is often clearly recognizable in the finished piece, making fine handmade jewelry stand out from mass-manufactured, uniform items. CG: Are there other ways buyers can tell the difference between truly handmade jewelry, and mass-produced jewelry that might at first glance appear handmade? For example, some of the jewelry that we find in large department stores today may appear "rustic," but that does not necessarily mean it is actually made by hand. RB: You will find that true handmade jewelry is typically not identical to other pieces of the same design. It is often easiest to examine jewelry that has considerable decoration -- many aspects. Examine each individual component; you can often clearly see how they are attached and constructed. Mass-produced or machine-made jewelry typically looks more rigid and uniform. Some handmade, traditional-style jewelry appears less perfect than machine-made jewelry, although high quality handmade jewelry should nonetheless be made to last, and this should be apparent in the details. Perhaps surprisingly, I have found that machine-made jewelry often breaks more easily than well-made handmade jewelry. Much of the mass-produced jewelry sold today as "handmade" may indeed be handmade, for example in department stores, but that does not necessarily mean it is of the highest quality. Mass-production facilities typically require artisans to meet efficiency quotas that result in poorly made jewelry, made with cheaper materials -- even if it is technically made by hand. I recommend looking for handmade jewelry that is not mass-produced -- not available in large quantities. High quality handmade jewelry often has an artisan's name and reputation proudly attached to the finished product. Fortunately, quality and uniqueness are typically apparent to the careful observer. RB: Handmade jewelry offers the pleasure of unique, often rare designs, that are not-identical, typically made by a true artist -- with great love and passion. Jewelry is an art form. I truly believe this strength of feeling comes across in the design process, and in the finished jewelry itself. Mass-produced items simply have less soul. I believe that handmade jewelry also better reflects the wearer's personal touch and style, expressing individuality and interest. To wear mass-produced jewelry, of a common style, to my mind lends the wearer the appearance of being somewhat mass-produced. Mass-produced jewelry can indeed be less expensive to purchase, because it is certainly less expensive to make, but it is not necessarily less expensive to purchase. Regardless, mass-produced jewelry usually brings with it no special meaning or history -- no story, no life. When you wear beautiful handmade jewelry, it is a pleasure to be able to explain to admirers the actual story or history behind what you are wearing, or information about the artist, which is often possible with handmade jewelry bought from individual artisans or their representative galleries. Above all, it is simply a joy to wear jewelry that someone has personally and lovingly created by hand. CG: Who are some of your favorite handmade jewelry artisans, in your region of the world, and why? RB: Wayan Sarjana is one of my favorite jewelry artisans in Bali. He has a wonderful personality, in addition to his high quality handmade jewelry. His designs are lovely, his prices are affordable, and his creativity is endless. Locally, Mariella, Priyo Salim, Agung Pribadi, Janice Ripley, and Zayd are a few other personal favorites. Fortunately, they have all agreed to participate on the Novica Web site, along with many of our other finest artisans here, so I have the honor to assist and represent them now. Each of their biographies, and collections, are included in the Novica Handmade Jewelry department, where you will find detailed explanations as to why I admire and recommend these jewelers so highly, as well as other favorite jewelers and artisans. CG: What inspired you, personally, to learn to make jewelry by hand? When did you begin? What style do you prefer, and what materials? RB: My background is in art and design. It has always fascinated me to work with my hands -- to let my soul, my mind, and my body link together in the process of making something new and exciting. I enjoy having private conversations with the materials I work with -- to play with these materials within my imaginary space, and to see the evolution and transformation of various components into a new form of existence. It is exciting. Many new ideas and silent conversations begin flowing during the making of any sort of art, including jewelry. I began creating jewelry in 1988, while studying at the Indonesia Art Institute. Then, I often visited a friend's jewelry studio nearby, and that is where I began to learn this art form. A few years later, when one of our big Indonesian magazines held jewelry design competitions, I entered, and twice was a finalist in their competitions, in 1990 and 1991. I enjoy creating both contemporary and traditional styles. I enjoy working with many materials, including sterling silver, gold, copper, wood, leather, bone, amber, and especially natural gemstones and pearls. CG: Do you still have time to make handmade jewelry these days, or are you too busy with your managerial work? RB: I wish I had more time to make handmade jewelry today! I am so busy with Novica. Fortunately my Novica work revolves around what I love most. I spend my days meeting with our region's most exciting master artisans and jewelers. Also, because of my personal expertise with art, including handmade jewelry, I can frequently offer helpful business suggestions to the artisans with whom I work, which brings me great personal satisfaction. I do also continue to make a few jewelry designs of my own, and I continue collecting materials, especially gemstones and pearls, for some new jewelry collections I have in mind. Jewelry is such a passionate aspect of life. I enjoy every minute of my work, whether working as a designer myself, or helping others who are dedicated to this beautiful and artistic way of life. Catherine Gallegos serves as editor-in-chief of Novica (part of the National Geographic family), a retail site featuring the handmade creations of artisans worldwide, including handmade jewelry. 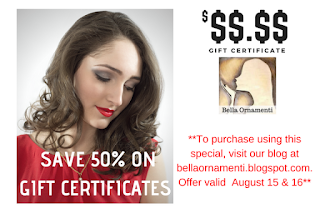 Don't forget, you can find my Handmade Jewelry at beabellaoriginal.etsy.com and be sure to use coupon SAVE25 for 25% off your order! !